You will hopefully find all questions to your answers here. What's the difference between the shipping options? Economy: cheapest way to ship your items. This option is only available for deliveries with a value under € 40.00. Please note that these deliveries are NOT INSURED! Standard: this option is available for some countries and deliveries are always insured. Premium: the best and fastest option. Deliveries are insured, trackable and they have priority in our shipping queue. What are those bones about? How can I reduce my shipping costs with my bones? Initially, bones are always used for reducing the shiping costs. But you can change this setting any time at MyInfraRot. Below the "email-Newsletter-Abonnement" you can find now a line with 'bones for reducing the shipping costs'. If you deactivate this option, your bones will not be used for reducing your shipping costs. That means you pay for each delivery the whole shipping costs. As soon as you activate the checkbox again, your bones will be used for reducing shipping costs again. For each 5 bones shipping costs can be reduced by € 1,00. Please note: Shipping costs can only be reduced in maximum for EUR 3,- (15 bones). How much bones do I have already? On the left side of "MyInfraRot" you can find a box named 'My Bones'. Find here how much bones you have already got from past shipments. At the overview of your current order (myInfraRot->my account->current order) is a list of how much bones you will receive after invoice and how much bones you will have to spend for free items or for reducing shipping costs. debit charge procedure: we debit the amount of the invoice due directly from your bank account, after the shipment left our house. This option can only be chosen if you live in Germany. Cash on Delivery: you pay the invoice amount directly to the postman when your parcel is delivered. When choosing this option, an additional € 6.00 have to be charged and this service is only possible when your order is sent to an address in Germany. 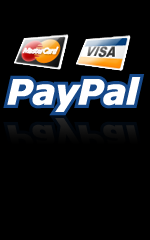 Payment in advance: you pay the amount of the invoice in advance via bank transfer or PayPal. To make sure what amount you have to pay, we will send you an invoice in advance as soon as we know which articles of your order can definitely be delivered. As we can send you an advance invoice normally only shortly before your order would be ready for dispatch, please note that by choosing this option your delivery will be delayed as we have to wait for the arrival of your payment first before shipment of the items is executed. Attention: for bank-transfers from non-EU countries, you have to take over all additional remittance fees! We only credit to your invoice the amount that finally arrives on our account! Credit Card: the cheapest method for foreign customers! Directly before your delivery leaves our house, your credit card is charged with the amount of the invoice.